Build your credit and create a foundation for the future. Get worldwide purchasing power and flexibility. 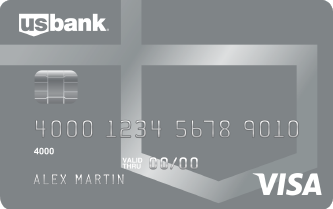 Help build or re-establish your credit history with the U.S. Bank Secured Visa Card.1 This secured credit card can be used like any other credit card, and is accepted worldwide. Fund online using your checking or savings account. Print an application and mail a cashier’s check or money order. Personal checks are not accepted. If approved, we'll send you a credit card with a credit line the same amount as your deposit. The deposit is used to open a U.S. Bank secured savings account to ensure your card balance can be paid. The savings account is FDIC-insured, earns interest and won't be touched as long as your account remains open and in good standing. Purchases with the U.S. Bank Secured Visa Card are billed to you each month as with any credit card. Payments are not automatically deducted from your secured savings account. You're responsible for making at least your minimum payment by the due date. Good credit is important for many reasons. Loan and credit card approvals are not the only benefit to keeping your credit strong. Visit our Financial IQ site for some easy ways to establish good credit and financial health.